By the outbreak of the Second World War, Magnelli had already had a full career. Self-taught, he stood out as one of the foremost painters of the avant-garde from his first visit to Paris in 1914, with his inventive use of flat tones edged with black. A friend of Apollinaire, Max Jacob, Picasso and Léger, Magnelli practised an elliptical form of figurative painting that eventually led him, after a logical process of simplification, to abstraction. He later renewed with cubist principles, followed by Explosions lyriques (1918), a return to constructive figuration (1921) and landscapes and, finally, works that evoked metaphysical painting. After interrupting his painting, he resumed his work again following a visit to the quarries at Carrara, where the immense blocks of marble inspired the series Pierres éclatées (1931), on which he worked until 1936 and which marked a step towards a new language that was to be his keynote. In October 1931, Magnelli settled in Paris for good. In 1934 he had his first one-man exhibition in the city at Galerie Pierre Loeb and met Kandinsky, who had arrived from Germany following the closure of the Bauhaus. From 1937, Magnelli’s work moved irreconcilably in the direction of abstraction. In 1939, he took part in the exhibition Réalités Nouvelles, organised at the Galerie Charpentier by Frédo Sides and Nelly van Doesburg. He showed at the first Salon des Réalités Nouvelles, for which most of the exhibitors showed again in 1946, an event that was announced as “a retrospective review of an art which only used lines and colours to serve the imagination and dynamism of the artist” (catalogue text by Yvanhoé Rambossom). During the Occupation, Magnelli took refuge with his wife on their property La Ferrage near Grasse. He met up again with Jean Arp and Sophie Taeuber Arp, as well as Sonia Delaunay. Together they worked on an album of lithographs published in Paris in 1950. This was an intense creative period for the artist, who began a number of works completed at a later date. The shortage of canvases and colours encouraged him to make collages and ardoises, works painted in gouache on school children’s slates (the first of these were done in 1936–1937). In 1944 he made a clandestine return to Paris and lived in the Villa Seurat. He took part in an exhibition at the Galerie L’Esquisse with Kandinsky, de Stael and Domela. In 1945, after the first Kandinsky exhibition, the Galerie Drouin at Place Vendôme presented a group of artists under the enigmatic title Art concret, which included Arp, Delaunay, Domela, Freundlich, Gorin, Herbin, Kandinsky, Magnelli, Mondrian, Pevsner, Taeuber Arp and van Doesburg. This group, founded by van Doesburg and which had taken the name of a review, had been part of Abstraction-Creation between 1932 and 1936. The event sparked off a dispute about the meaning of the words ‘concrete’ and ‘abstract’, opposing Raymond Cogniat against Jean Arp, Jean Gorin and Herbin in the review Arts (June and July 1945). In 1947 a major retrospective of Magnelli’s work was held at the Galerie Drouin, for which Jean Arp wrote the catalogue preface. This event positioned him as a major figure of modern art. Léon Degand wrote about the works of this period: “We are immediately struck in Magnelli’s work, by the precise, decided and flawless manner in which he expresses himself… With Magnelli, the style is born from a perfect adaptation of the mode of expression to what it is meant to express. This form of brutal courage knows no concession or complacency” (Magnelli, Il Cavallino, Venice, 1952). 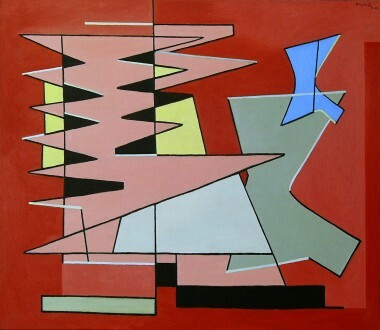 In 1949 he had a one-man exhibition at the Galerie Denise René and, from 1948, Denise René included him in group exhibitions: Sculptures et peintures contemporaines and Tendances de l’art abstrait. The artist continued to show with his friends at the Réalités Nouvelles. 1949 Quelques aspects de la peinture présente. 1950 Quelques aspects de l’art aujourd’hui, Espaces nouveaux. 1951 major travelling exhibition in Scandinavia and Belgium, Klar Form, 20 artistes de l’École de Paris. 1952 12 tapisseries inédites woven by the Tabard workshops in Aubusson as well as in 1954, and then at the Galerie Blanche in Stockholm in 1955, followed by the Museum of Modern Art in Rio de Janeiro in 1956. 1953 Denise René présente. 1955 Documenta de Kassel; in 1956 10 ans de peinture française 1945–1955, Musée de Grenoble, with Sonia Delaunay, Hartung, Lapicque, Léger, Deyrolle, Herbin, Mortensen, Vasarely and at the Internationale Sezession, Leverkusen Stadtisches Museum. 1958 Hommage à Léon Degand, Galerie Denise René, Paris. Retrospectives were held from 1954: Brussels (1954), the Stedelijk Van Abbe Museum, Eindhoven (1954), Musée Antibes (1955), Zurich and Florence (1963), Essen (1964), Kunsforeningen, Copenhagen and Musée d’Art moderne, Paris (1968), Musée Ancienne Douane, Strasbourg (1969). Catalogues. In Paris, Magnelli exhibited in 1957 at the Galerie Berggruen and the Galerie de France, and again in 1959 at the Galerie de France, which the following year published Magnelli by François Le Lionnais. Prix de la Critique in 1954. First Grand Prize for Foreign Painting at the Sao Paulo Biennial in 1955. Guggenheim Prize for Italy in 1958. These awards brought Magnelli an international audience. From 1959 he lived and worked in his villa at Meudon, dividing his time between Paris and Provence. His works are grouped in series. He participated regularly in the Salon des Réalités Nouvelles from 1946. In 1968, Jean Clay summed up the considerable contribution made by Magnelli’s work. “He is both for the curve and for the straight line, for the subjective form and for discipline. His forms are simple and massive without being impersonal; dynamic but placed against a background that stabilises them; slender but endowed with a certain static weight (Jean Cassou spoke of ‘writing in bronze’). By attempting to reconcile the irreconcilable, Magnelli serves as a guide to an entire generation who discover abstraction more than thirty years after its beginnings and who, initially, need a mediator who is not a fanatic. This explains the historic role of Magnelli who is very much admired by the young” (Magnelli chez lui, Connaissance des Arts, March). 1988 Magnelli, exposition du Centenaire. Palais des Papes, Avignon. Catalogue. Texts by Daniel Abadie and Maurice Besset. Consult bibliography and list of exhibitions. 1989 Magnelli. Thèmes et variations. Chapelle de la Sorbonne. Paris. Catalogue by Daniel Abadie. Magnelli’s work is present in many museum collections including: Paris, National and Municipal d’Art Moderne, Bibliothèque Nationale (donation Mrs Alberto Magnelli. 1980 Exposition des estampes et de l’œuvre graphique. Catalogue) – Grenoble – Vallauris – Fondation Maeght Saint-Paul-de-Vence – Rome – Turin – Copenhagen – Zurich – Liège – Rio de Janeiro – Sao Paulo – La Chaux-de-Fonds. André Verdet: Magnelli, Le Musée de Poche, G. Fall, 1961. Murillo Mendes: Alberto Magnelli. Ed. dell’Atheneo, 1964. Anne Maisonnier-Lochard. Catalogue raisonné de l’œuvre peint d’Alberto Magnelli 1907–1969. Paris, Classiques du XXe siècle. Musée National d’Art Moderne, 1975. Catalogue raisonné de l’œuvre gravé. Paris. Bibliothèque Nationale, Paris, 1980.